Sean Dyche felt Craig Pawson refereed the 2-2 draw at Brighton “wisely” amid criticism of a number of challenges from Joey Barton. Much was made of a perceived stamp from Barton on Albion’s Beram Kayal, and a later arm in the face of the Israeli midfielder, as the Clarets twice came from behind to claim a vital point at promotion rivals. 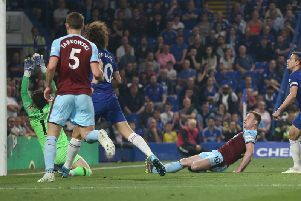 There was only one booking in the game, for home keeper David Stockdale, and Dyche was happy there was no malice in either Barton incident: “I know you will ask me about Joey, but at least there was a parity to that, at least they went ‘not that, not that’. “The trouble comes for managers when you don’t give that, and give that. “At least the referee managed it wisely in that sense. “I watched, right in front of my eyes, a challenge from Ashley Barnes at Chelsea, and there was uproar. But Dyche was unhappy with Anthony Knockaert’s reckless first half challenge on Stephen Ward, which also went unpunished: “I just feel, I don’t think it was a sending off, but nothing happened, we keep getting told the rules are you have to be in control of your movements, it can’t be a straight foot, it’s got to be a toe, you can’t put your studs up, so I can’t see that, and there’s uproar every time Joey goes in for any challenge. “Theres got to be balance. I don’t wish for people to be sent off, but I think that’s got to be officiated as well. “In my day that was regular, everyone got on with it, but they’re not my rules, they keep telling us those sort of challenges are not acceptable, and there was another one on Andre Gray from the centre half, coming through from the back with a straight foot.